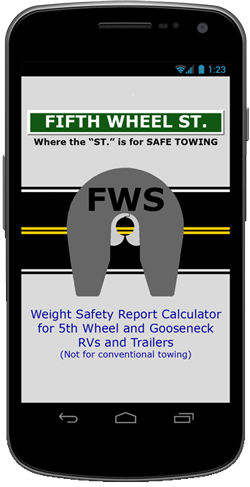 After completing Step 3, the Weight Safety Report, it's important that the RV load distribution is adjusted, if necessary, and adjust tow vehicle and trailer tire inflation pressure per the current recommendations. 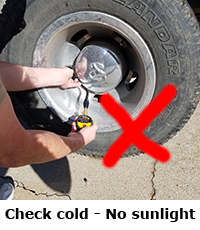 The best time to check the cold tire inflation pressure is first thing in the morning before departure and when sunrays are not affecting the tire's ambient temperature. Additionally, tires should not have been driven more than one mile or wait at least 2 to 3 hours after parking. Tire temperatures in direct sunlight may increase as much as 40 degrees in as little as 30 minutes, which will give you a higher than ambient pressure reading. Do not correct tire inflation pressure when the tire temperature is above the ambient surroundings. If a warm tire is below the normal cold pressure setting, that could be an indicator that some component may be failing. Jump to "Selecting the Correct Tire Pressure for Tow Vehicles and Motorized RVs"
We at Fifth Wheel Street no longer recommend adjusting trailer tire inflation pressure below the pressure associated with maximum load PSI rating molded on the sidewall (and only if the wheel/rim is appropriately rated) for tires that have a maximum of 85 PSI or less, regardless of the measured scaled weight of individual tire or axle positions for all multi-axle trailers. RV trailer owners having tires with greater than 85 PSI max rating can use the manufacturer's tire load charts available below. For trailers with max cold air pressure greater than 85 PSI, until the trailer has been weighed, never inflate less than the manufacturer label or the max cold air pressure molded on the tire. However, we do strongly recommend weighing individual trailer tire positions for the trailer, as well as the tow vehicle or motorcoach, to ensure none of the axles or tire positions are overloaded. Reports have shown that trailers do not have equal weight across all tire positions. Some RV load configurations may reveal as much as 20% difference between the front and rear axle. This especially true for Toy Haulers. It is possible that mismanaged trailer load distribution will cause one end of an axle or a tire to be overloaded. It has been stated, but never confirmed by any RV Weigh-master, that there are many RVs traveling on the road with at least one tire or axle side overloaded. The only way to ensure tires and or axles are not overloaded is to weigh each tire position on your vehicles. Unfortunately, attempting to obtain accurate individual tire position weight is practically impossible at all truck scales. View our list of recommend RV Weigh-masters here. Option One: Per the minimum tire requirement stated on the vehicle's Certification Label. Note: This is the max cold PSI for this OEM tire. 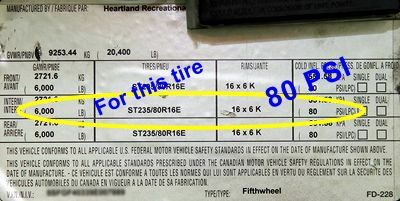 If the tires currently installed on your trailer are different than the OEM label, this label no longer applies. Use option two below. Option Two: No less than the tire's cold PSI molded on the tire's sidewall associated with max load and not exceeding the wheel/rim PSI rating for tires with a max of 85 PSI or less. Here's the reason in 50 seconds. Note that the tire on one axle bends inboard while the other is forced outward. When a radial tire is loaded, the belts and body have to bend from a round shape to a flat shape in the area that contacts the road. Additionally, when you turn a corner, the forces generated to move the RV sideways have to be transferred through the tire structure. This causes additional bending of the belt and body structure. Increased bending causes increased stretching of the rubber. With enough stretch, microscopic cracks form and existing cracks get bigger. Eventually with enough cycles and enough force, cracks may grow and this increases the possibility of tire components separating which could lead to a tire failure. You can lower tire stretching if you decrease bending and you can decrease bending if you increase tire inflation. If you own a multi-axle trailer, tire bending forces can be much higher than those seen on a tow vehicle, motorhome or car. Tires on these types of vehicles are not close together and are located at the corners of the vehicle. Special consideration for multi-axle trailers. Warning, this gets technical. When not driving in a straight line, there are significant side loads on multi-axle trailers because the tires are fighting each other; this is because the axles are not "pointed" to the center of the radius of the turn. These loads cause interior structural tearing. Sometimes, loads may be 20% or more higher than those seen in tires on non-trailer applications. Initially, tearing begins at the microscopic level, but with time and repeated cycles, these microscopic tears grow, which can lead to small cracks at the belt edges as seen here at the arrows. If not spotted, these cracks continue to grow to almost the full width of the tread as seen below. If you are lucky, you will see the bulge in the tread as seen on the left. Clearly, you know this tire has failed and MUST be removed AT ONCE as the separation can grow and can cause a belt to come off the body of a tire. You can lower these forces by either decreasing the load by at least 20% on the tire (probably not something you want to do or may not be able to do) or you can increase the inflation to stiffen the structure which will decrease the slip-angle. In this case, you could increase the tire inflation from the minimum inflation needed for the static load to the inflation associated with the max tire load as molded on the tire sidewall. BUT, you need to be sure you are not exceeding the max rating of the wheel/rim. Therefore, the best recommendation I can give to trailer owners is to run the max inflation molded on the tire sidewall. For owners of a tow vehicle or motorhome, I recommend you run the inflation needed to carry the actual measured tire load plus at least a 10% margin. What should trailer owners do? Before retiring, Roger spent 40 years in the tire industry working for a major manufacturer developing tires for applications in North, Central and South America. During his career he worked on many kinds of tires - heavy truck, passenger, light truck and Indy-car types. If you have a question for Roger, email him at tireman9(at)gmail.com. Also, visit his blog for additional RV tire safety information at RV Tire Safety. Never exceed the maximum load rating molded on the tire's sidewall. Never exceed the maximum inflation rating for the wheels/rims or valves when setting the tire cold inflation pressure. Never inflate tires more than 10 PSI above the maximum PSI rating imprinted on the sidewall. Never install tires rated less than required per the Certification Label. Never consider an anticipated temperature change during the day's travel when setting the morning cold inflation pressure. Inflating tire pressure above the tire's sidewall rating does not increase the load rating. Note: RV expert, Mark Polk, wrote an excellent article about using LT tires on trailers. Read it here. A note from the founder: Many trucks have labels recommending two tire inflations for when it is unladen and laden. For many applications, the recommended tire inflation for laden trucks is usually more than is required. When truck tires are inflated more than is necessary to carry the actual load, the center of the tire tread bulges out more, therefore places mostly the center portion of the tread on the road surface. Reduced tread contact is not desirable in any situation. After experiencing center tread wear out on my truck’s OEM tires, that is when I began to pay more attention to tire inflation. Even with 3,400 pounds of added pin weight on the rear axle, that was not enough to cause the tread to make full contact on the road surface when inflated to the label recommended 65 PSI. For this reason, I encourage you to use the 4-Step Weight Safety Plan, and from that, you can obtain the unladen and laden weights. Use the load charts below to correctly set the tire inflation pressure based on the measured weights. Caution: The recommendation below is a starting point. Without the ability of weighing each axle end on a scale, it's possible that one of the tire loads is significantly greater than the calculated average. Always monitor tire wear and adjust inflation pressure accordingly. Whenever possible, weigh all tire positions at each end of the axles. For weighing purposes, dually tires on each end of an axle is considered one position. To learn more about irregular tire wear patterns and measuring and recording tire wear, click here. Roger Marble of RV Tire Safety recommends additional 10% PSI for Class A vehicles and other tow vehicles. Look for item "A" (Total Front Axle Weight) on your Weight Safety Report. Look for item "B" (Total Rear Axle Weight) on your Weight Safety Report. Divide item "A" by 2, which is the number of tires on your front axle. Divide item "B" by 2 if you have a single tire on each end of a rear single axle. Divide item "B" by 4 if you have dual tires on each end of a rear single axle. The quotient is the average load weight of each tire load. Use this starting weight range. Then follow up the column to select the inflation starting pressure for your tires. The starting tire inflation pressure is 60 PSI. The starting tire inflation pressure is 45 PSI. Read Roger Marble's full writeup and how-to calculate the PSI for motorhomes here. Jump to "Selecting the Correct Tire Pressure on Multi-axle Trailers"
Do you want to know if your tires were made in the good ol' USA? Or, maybe you need to check if your tires are on a recall list. 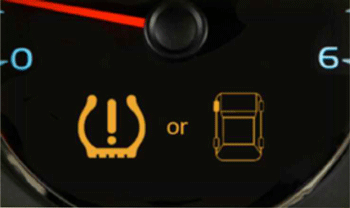 That 42 percent of drivers are unable to identify the low-tire-pressure warning light in the gauge cluster. The National Highway Traffic Safety Administration (NHTSA) has found that under inflated tires are the cause in an estimated 200,000 accidents, 33,000 injuries and 660 deaths each year. Almost as bad, an equal percentage of those polled admitted to rarely checking the air pressure in their tires. This would indicate that nearly half of all drivers on the road don’t recognize the TPMS warning light and aren't regularly checking their tire pressures. Driving with properly inflated tires makes vehicles safer and more efficient, and tire pressure monitoring systems (TPMS) are designed to help alert drivers to under inflated tires. Read the full report here.